The hits keep coming for Adobe Youth Voices. 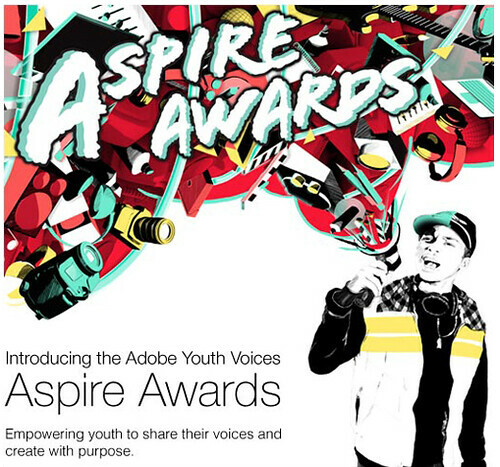 Today, the Adobe Foundation announced that it has joined forces with MTV, Dell and Samsung as supporting partners of the Adobe Youth Voices Aspire Awards. Launched just this year, the Aspire Awards are a first-of-their-kind online youth media competition and festival showcasing creative media from teens ages 13-18 worldwide. The awards honor youth who creatively communicate a vision for change in their communities and lives through video, print and audio projects. We’re thrilled to have the support of MTV, Dell and Samsung for the inaugural AYV Aspire Awards. As part of its involvement, MTV is presenting a special award to recognize one young person whose exceptional video content leverages music, and provides a clear call to action for the audience. The recipient of this award will win a trip to MTV studios in New York City! Students are invited to participate in partnership with an educator, who will submit media on behalf of their students in eight media categories ranging from documentaries to graphic design. Entries will be evaluated by a global panel of teen peers, youth media professionals, educators, media industry experts and filmmakers, including Neil Bennett, Sarah Kay, and Robert Kenner. MTV Act, which celebrates young people who take action to make things better, will feature Aspire Awards winners on the MTV Act website. Submissions must be made by April 20th and we’ll announce the semifinalists on May 4th. So spread the word to a creative student and visit our Aspire Awards website for more details.